The Eremitani Museum is the civic museum of my city, Padova, located in the cloister of the former Eremitani monastery. The ticket includes the Archaeological section, the Medieval and Modern Art section, the Zuckermann Palace (crossing the street – I’ll talk about it in another post asap) and the adjacent Scrovegni Chapel. So there’s a lot of things to see! First of all (on the ground floor) you can admire relics of the Paleoveneti (Indo-European people who once inhabited the Veneto), along with Roman relics, coming from Paduan necropolis: vases, amphorae, stelae, votive objects. The highlights are the stelae, the bust of Silenus, the funerary shrine of the Volumni and some mosaics. Two rooms host the archaeological finds by Paduan explorer Belzoni (you’ll see his bust). His story is very interesting. Born in Padua from a barber with other 13 kids, he moved to Rome at 16 to study hydraulics and Roman ruins. Then he traveled extensively. While in England he got married and joined a circus, which led him to Malta. There he had the chance to show his newly invented hydraulic machine. Due to his invention, he was noticed by the British consul to Egypt, Henry Salt, who asked him to remove the 7 tons Ramesses II bust. As a result, the bust is now at the British Museum, so Belzoni nailed it. Among Belzoni’s other endeavoures: opening the sepulchre of Seti I, being the first one to penetrate in the second pyramid of Giza and recovering the Philae obelisk (now in Kingston Lacy, Dorset), important to interpret hieroglyphics. This is a huge collection of paintings (about 3.000) from 1300 to 1800. It is divided into sections. Titian: The birth of Adonis and Death of Polydorus. I don’t know about you, but I could stare at Titian’s paintings for hours! Bonifazio de’ Pitati, Boccaccio Boccaccino, Francesco Vecellio: I was amused comparing the different baby Jesuses. One trying to grasp the crucifix, another one already in a holy attitude and the third one playing with the veil. At some point I spotted a painting that wasn’t a masterpiece in the slightest but it made me smile. So I decided to include it. It portrays an old man with a pumpkin. The writing says: Carlo Casotto born in Montecchia in 1710. 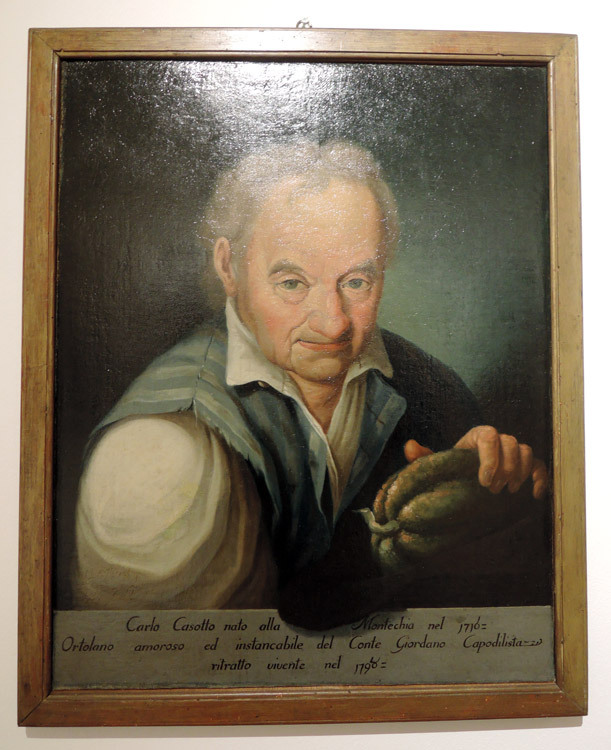 Passionate and tireless ochardist of count Giordano Capodilista, living portrait in 1790. Isn’t it sweet? In the same room you’ll find Metsys‘s St. John Evangelist and The call of Peter by Henri Met de Bles. The visit continues and we arrive at the highlight of the collection, The Crucifix by Giotto (once in the Scrovegni Chapel), a true masterpiece. Squarcione: De Lazara polyptych, sadly a bit ruined. Squarcione’s workshop was a eminent centre for the diffusion of the Renaissance in Northern Italy. Molinari: Not a masterpiece but another interesting fact. This painting portrays Elena Lucrezia Cornaro Piscopia, first graduated woman in the world. And it happened precisely in Padova. I also liked the 1700s Prato della Valle painting by Fossati. Then, between two statues by Canova (Alvise Vallaresso dressed like Aesculapius and Giovanni Poleni) the Saint Patrick by Tiepolo. Another masterpiece is the breathtaking the Penitent Magdalene statue by Canova. Most noteworthy also some landscape paintings, Geography lesson by Longhi, a portrait by talented Rosalba Carriera, a Madonna and the St. Joseph and Child by Tiepolo. Really sweet and charming tiny canvas. Until September you can also see some newly added Tintoretto. Learn more in my post about the “rediscovered Tintoretto”. The path to follow wasn’t always clear. But there are many super kind attendants. When I visited it, there were no English explanations. But I was told they are preparing them. Let’s hope so! Horrible to see Tintoretto and Veronese partially covered by the “fencing system”. Probably the room was ready for a meeting (there were chairs), so I can undertsand the need to protect the paintings. Yet I was quite disappointed, mainly because I couldn’t consequently take any proper picture for this post. Since the entrance can be hard to find, I linked in the box below the Google maps pin. If you arrive from the train station, go straight towards the city centre (on the left side of the street), pass the bridge, walk along the park and along the Roman arena following the final sidewalk curve. As a result you’ll arrive at the Museum gate. First of all, leave your bags at the wardrobe on the right. The complex is huge. Therefore it is easy to get confused. I had to ask for information twice because I wasn’t sure where to go. I must say that the staff was really kind and helpful, though. Consequently it was not a big problem. In conclusion I’ll suggest a visit to those interested in archaeology, medieval and modern art and in learning something more about the past of the Paduan area.